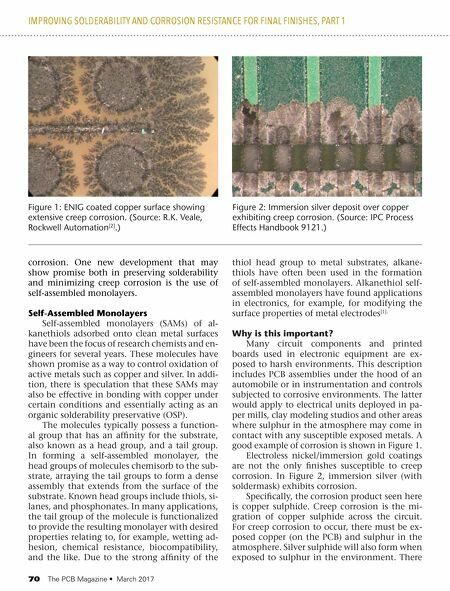 March 2017 • The PCB Magazine 71 is ample documentation highlighting the vul- nerability of certain solderable finishes to creep corrosion. Robert Veale of Rockwell Automation deter- mined that immersion silver and ENIG exhib- ited corrosion when subjected to Battelle Class III harsh environment and ASTM B845. The IPC B-25 comb pattern was the test vehicle used in the study. The center comb pattern was bi- ased with 5V DC and all the other areas were unbiased. There were two sets of test boards with one set having no soldermask applied and a second set with a soldermask overlaying the comb pattern conductors as described below. (The results with the soldermask applied will be presented in a future column.) The test condi- tions are shown in Table 1. At the end of the 20-day test period, the test vehicles were examined for the extent of cor- rosion. In a future column, more information on creep corrosion prevention will be presented as well as the performance of other solderable finishes under corrosive environmental condi- tions. What has not been determined in this study is the effect, if any, on corrosion resis- tance with the use of self-assembled monolayer chemistry. That will be the subject of a future column. Summary Corrosive environments have an adverse effect on some solderable finishes. In this edi- tion of "Trouble in Your Tank," the corrosion resistance of ENIG and immersion silver was discussed. Creep corrosion is a definite issue for these finishes when subjected to a corrosion en- vironment under conditions described in ASTM B845 and Battelle Class III. Future studies will be undertaken to determine the effect if any of self-assembled molecules on solderability im- provements. PCB References 1. C. Zhou, M. R. Deshpande, and M. A. Reed L. Jones II and J. M. Tour, "Nanoscale metal/self- assembled monolayer/metal heterostructures." Downloadable here (possible subscription re- quired). 2. R.K. Veale, "Reliability of PCB Alternate Surface Finishes in a Harsh Industrial Environ- ments," SMTA, 2005. Michael Carano is VP of technol- ogy and business development for RBP Chemical Technology. To reach Carano, or read past columns, click here. IMPROVING SOLDERABILITY AND CORROSION RESISTANCE FOR FINAL FINISHES, PART 1 by G. Sidney Cox, COX CONSULTING Abstract High-speed rigid boards have existed for many years, with fluoropolymers being the most common dielectric initially used. More recently, flexible circuit materials have been developed, and these new products use a variety of polymer (including fluoropolymers) and composite film approaches to allow high-speed flex circuits. This paper will provide guidelines on how to compare the different options. The electrical benefits of the different polymers and constructions, as well as physical and flexible properties of different constructions will be reviewed. Read MORE in the April issue. 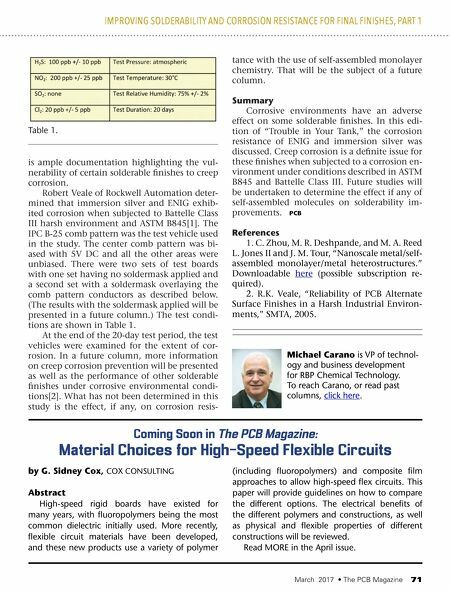 Coming Soon in The PCB Magazine: Material Choices for High-Speed Flexible Circuits Table 1.